Despite being dropped into a cannon fodder timeslot, TVB’s historical period drama The Executioner <刀下留人> has won the support of viewers and critics. Starring Kenny Wong (黃德斌) and Maggie Shiu (邵美琪), The Executioner made a grand finish with an all-time peak rating of 31 points during its final episode, which aired on Sunday, January 10. The Executioner, a historical fiction series that takes place during the era of Emperor Chenghua in the Ming Dynasty, premiered on December 7, 2015. Praised for its unique script and meaningful dialogue, the drama averaged 1.6 million viewers per episode during its broadcast run. The last episode, which aired on Sunday, January 10, achieved an average rating of 28 points, peaking at 31. The entire series averaged to 25 points. This easily puts The Executioner as one of the highest-rated dramas of 2015, out-ranking even last year’s anniversary dramas. Its competitors—Come Home Love <愛回家> and Wu Xin: The Monster Killer <無心法師>—neither improved nor worsened during The Executioner’s finale week. Come Home Love achieved an average rating of 23 points, while The Monster Killer stayed the same with 22 points. 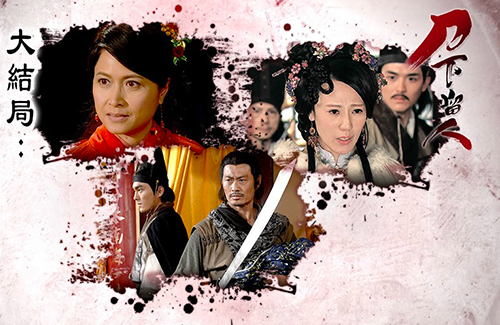 The Executioner was met with mixed reviews when it first premiered on TVB Jade on December 7. Many critics found the title too corny and the main cast, which is largely led by smaller TVB actors, to be underwhelming. However, the series quickly picked up its pace and found its ground. Episode 25, which involved the death of a main character, received universal acclaim from viewers. TVB chose the right actor to be ‘the executioner’. he has that kind of manly look and very cool. the part where he wanted to die in the fire was very touching. i really pity his character to have to live on alone after executing the one he loves. it was a show i was going to skip but it was not bad after the first episode and it got pretty good after a few episodes. i think the show’s got a pretty good script. the cast was what i didn’t like as i really don’t like wong duck bun but he suited the role well. i thought the story is very unique, one of a kind that’s been missing in tvb and the death of a main character before the finale was unexpected but well written. i forgot to mention that i felt for every character. you can actually feel the characters and understand the reason they did certains things. i don’t often watch shows where i would feel for the character. I quite enjoy this series. The story is ok even if very weird in its too positive in the execution part. I feel there is no moral. Kenny Wong manages to act the entire series with one expression. Frankly he was the weakest link and a very wooden performance. THe others were just fine, Katy Kung did very well. The ending is bleak, and confusing, and some downright WTF moment (how come Matt suddenly knows Kung Fu? and what’s with the who she ends up with ending). But overall, frankly, it is one of the better series from 2015. The highlight was the brother sister love. Such a sad sad ending for that one. Very well acted by.. Rachel what? Very well acted. Hong Wah did well too. Basically the women did well, I get why Kenny Wong got the role but frankly seriously, one expression throughout. Almost bore me to death. @funnlim Kenny Wong’s character in the drama is supposed to be expressionless, emotionless and wooden. And that should be the right persona of an executioner. Of course he is boring. What do you expect him to be? A happy-go-lucky guy who goes round joking and slapping his pals in the back after each execution? Put on a sunny smile and shout hello to anyone he meets in the street after chopping someone’s head off? The fact that Kenny managed to keep just one expression under all circumstances is a credit to him for staying in character, it’s not a negative thing. Know what you are criticizing, not just based on what you feel. I quite liked The executioner. It took a while for all the pieces of the plot to fall into place but when it did, it was interesting. History wise, they got all the facts wrong, but it was a refreshing plot that was not cliched. It was a good to see Hugo back though i thought the role was limiting. I hope he jas a better villain role in brother’s keeper. I was a good try by TVB to be original. Each character was so well written, they all had a backstory for how they came to be, something not many other dramas posses. Even though the cast aren’t first line actors/actresses, they all CAN actually act which made for easy viewing, and I like that it wasn’t a typical happy ending. Akina Hong’s crying scenes were very well-done. And she looks very good for someone in her 40s. Too bad this is her last TVB drama. LOL, the thought of Maggie Siu and Kenny being in the same drama together as LEADS is enough to sway me away from watching. You know TVB is at their last breath when Kenny Wong is cast as a lead. That guy can’t act if his life depended on it. Somehow I liked Kenny Wong in this drama. He is supposed not show too much emotions via the face, as he had kept his emotions locked away long ago since he was going to be executed. This is why he was sooooo attached to Maggie’s character, as she seems to be able to read his wood face. The person who played the sister was very good!!! She was able to show how much she loves her adopted brother, the siblings way. Good show. Maggie’s death was so unexpected, but well executed. Really? Universal acclaim? WOW MUST WATCH THEN! Absolutely like watching this drama. ..especially Kenny and Maggie part very touching and sad when Ah Fa’s death. A thumb up for good rating ! Love Maggie’s performance in this drama.